Leah's Legacy personalized Bible covers are beautiful! Have you ever wished you could find personalized Bible covers – especially for gifts? Do you find that one size cover does not truly fit all? Do you find that you cannot find yours amongst the other prayer books in the pew at church? Or that someone picks up the wrong one? 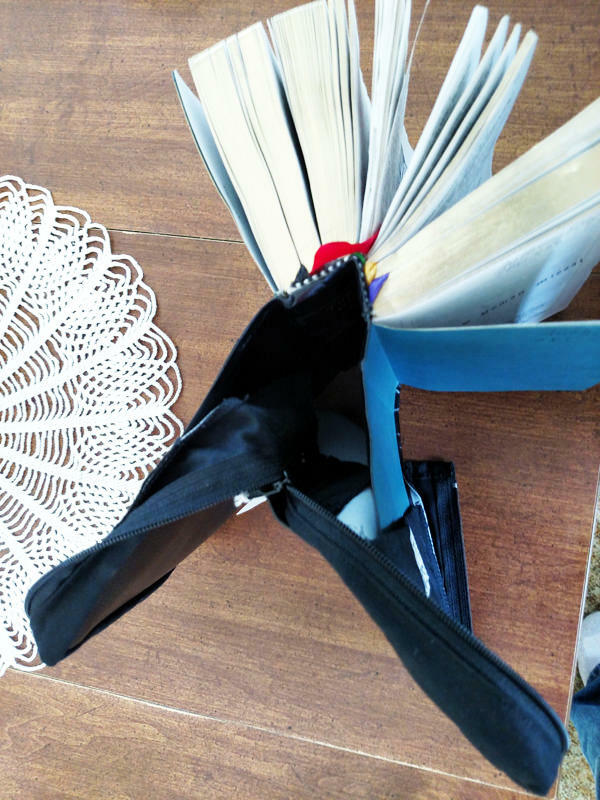 Is your Missal the main book you carry back and forth? One size does not fit all. Sometimes covers are so big that it makes the Bible or Missal hard to read. Or the zipper does not give the book room to open flat. A sweet lady sent me a note about her business selling custom Bible covers. I was thrilled to see these as they are beautifully made and are just the answer for a perfect fit. Being personalized they are also the answer to everyone's cover looking the same. She offered me a sample hoping that I would put a link to her site, so I was glad to choose one that would fit our son's book. Talk about custom, she made it exactly the right size and put beautiful embroidery on the front cover - his choice. Seeing this wonderful treasure, I'm very happy to link to her Leah's Legacy list of scores of personalized Bible covers. See one here. I explain why throughout this page. Print the poster for your bookstore, family and friends. Easy to order many beautiful choices. Many times the men like a plain cover so these can be made and sent to you more quickly. Be sure to send your book's exact size. Print the poster for your family and friends or ask Father if you can post it in the vestibule at the church or in your bookstore. Beautiful gift for a conversion, Confirmation, or Wedding. Since these children's Bible covers are custom made; you can get them to fit any sized book, even small children's Bibles or prayer books. 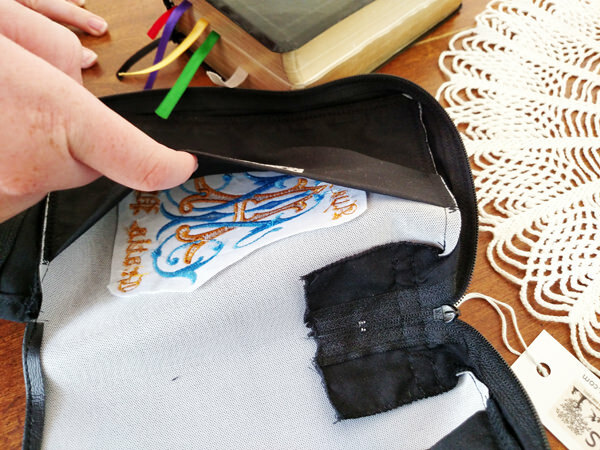 Children really like the different colors and embroidery on their personalized Bible covers. Personalization makes it easier for children to tell which is theirs. It also encourages them to take good care of their special book. It's "mine". Most people at church have a cover. So, how do you tell yours from the next black clad treasure? Get one of Alyssa's personalized Bible covers to differentiate yours from the crowd. This way both you and others know who owns which book. Custom here means choose your front cover's design, wording and vinyl color. Personalized means that you can add initials or a name to the back cover. Another idea: Be sure to write your full name and phone number in several places in the book, especially the front title page. Contact Alyssa to make special requests using her contact info here. A family Bible, prayer book, or Missal may be the most expensive books most folks buy. Personalized Bible covers can protect them from humidity and dust and help you find yours in the stack. Personally, I'm a firm believer in using covers ever since the Sisters required them when our oldest were in school more than 15 years ago. Instantly, we recognized a good idea. The year before this we'd seen a friend's prayer book dropped in a puddle. Ouch! We were all dismayed. Most of the book was fine with just some edges needing to be dried, yet those pages are now all wrinkled. At least she picked it up quickly before the whole book was soaked. Later, when our oldest son was in first or second grade he lost his little children's Missal, a child sized book. Years later the Sisters found it when the men were redesigning the landscaping around the school. Guess what? It has many water marks and a bit of mold, yet it was protected by its cover - all those years. He's grown now, yet we still have this little treasure of his first days studying the Faith. Because these covers are zippered, your holy cards will not get lost. The material is of buttery soft Naugahyde that will not crack in the freezing temperatures, feels nice to the touch, and flexes while in use. Our zippered covers have kept our Missals useful for over 15 years. There are many times we've been glad to have our zippered covers. They've survived rain, being dropped in the snow, slid around under the seats in the van, and many more of the hazards in family life with many little children. We were tempted not to cover the younger children's books. The Sisters kept us in line there and we are glad for it. First, one of our favorite little prayer books went out of publication. So sad. Yet, we sure have our first four children's copies in good order because their covers protected them. For years the only one of us who did not get a cover was Dad. No one was checking to see that his book was covered and we never felt the need to spend the extra money. Guess what? His is the only Missal that entirely broke loose of its binding. Me? Mine is breaking, yet that is my fault because I left the cover open once and dropped it. A huge thank you to our Sisters! Hold the Missal from underneath to avoid pulling out pages. Sharp or thick edged ribbons can cut page edges. Too many holy cards can break the binding of a Missal. Keep the Missal cover zipped when walking or traveling. I hope that these notes help you preserve your Bibles, Missals and prayer books. Inside covers are nice and deep and can many hold holy cards. Slide the front and back cover in the cover at the same time. 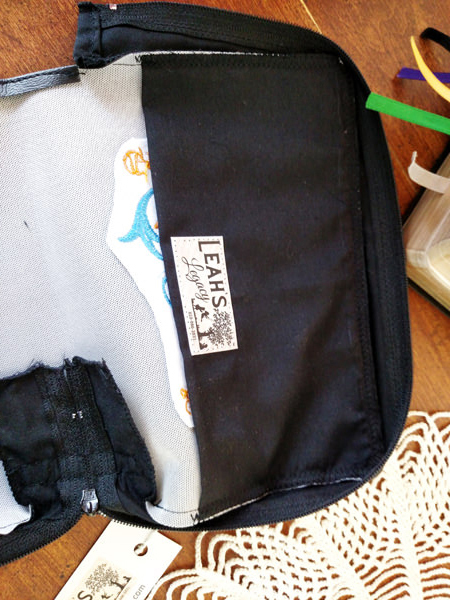 The embroidery is stitched into a sturdy backing pad. The custom stitching will last. We received our cover in very nice condition from the packaging to the final product. It arrived within three days. It was carefully packed and ready for gift giving. I loved the beautiful embroidery that also has a good backing so that the stitching does not pull through the cover. The cloth material is very sturdy; not the cheap brittle plastic of some vinyl covers, but a rich buttery leather-like Naugahyde. I am so glad that the zipper stops before the ribbons. This is certainly the most beautiful Missal cover we own. Pictures tell you the whole story. This is gorgeous! Covers also make wonderful gifts especially at adult Baptisms, Confirmations, and weddings. 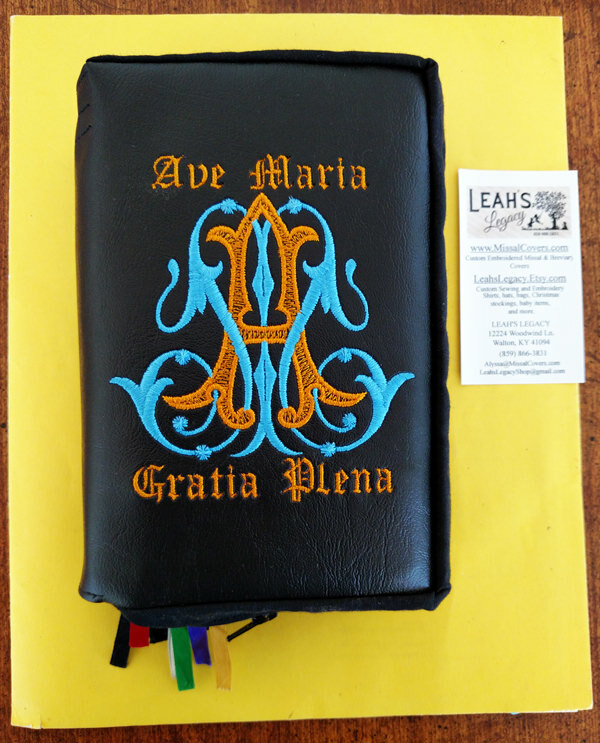 I think that you'll love having one of these personalized Bible covers and Missal covers. I do. See Alyssa's personalized Bible covers at Leah's Legacy here. 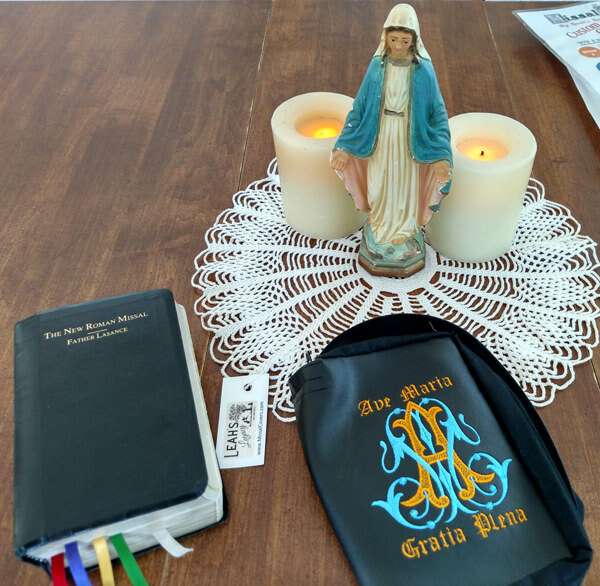 Protect your missal or breviary from wear and tear with a sturdy, beautifully embroidered, vinyl cover from Leah's Legacy. Have an old missal that has a worn, torn, or taped up cover? Slide it into one of these stunning covers and your missal is better than new! 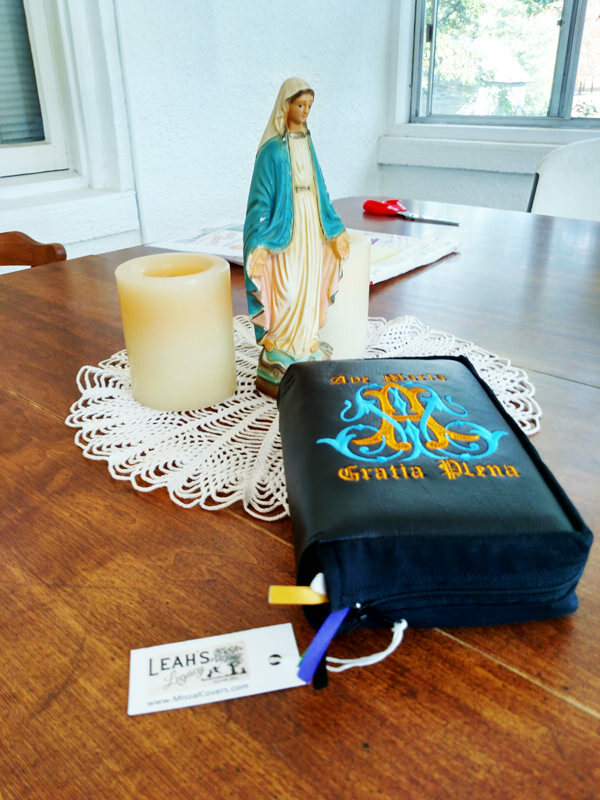 These covers can be made to fit ANY missal, Bible, Breviary, child's missal or any prayer book. Save your holy cards and bookmarks from being lost! The zipper closure keeps your cards and papers safely inside while protecting the page edges from being bent or drenched from rain. The cover is designed to leave an opening at the base of the spine where the zipper stops, allowing your ribbon bookmarks to hang freely. Each personalized Bible cover is custom made with high quality materials according to your specifications. Choose your size, vinyl color, embroidery design, and wording. There are currently 15 embroidery design choices available for further customization. A monogram or name can also be added to the back cover for a small fee. 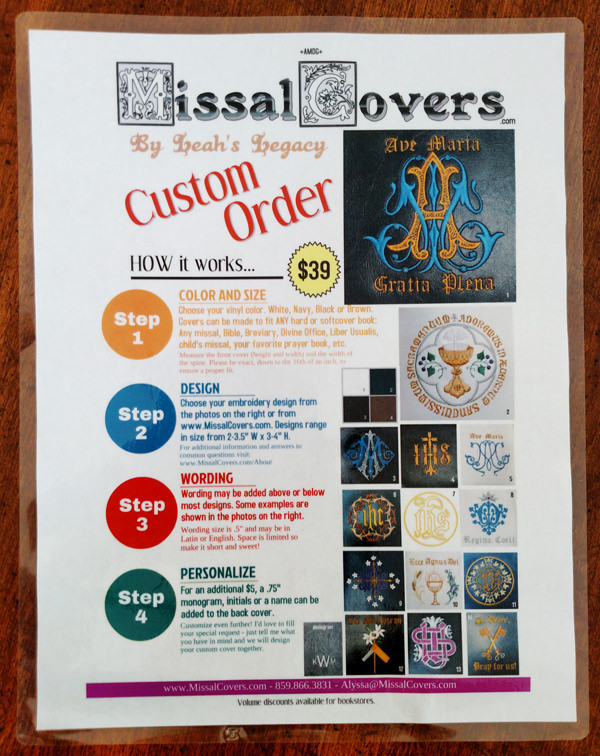 View Leah's Legacy Bible and Missal covers here. From the looks of her Etsy page you can see lots of other custom gift ideas for sacrament days, feast days, birthdays, and Christmas. 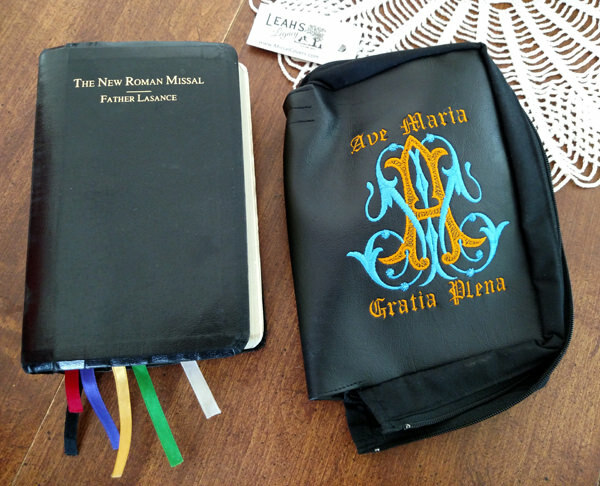 Alyssa makes heirloom Bible covers that you can personalize for your Missal or prayer book.